Report by Transportation Safety Board says improper marshalling led to derailment of CP Rail train on Stoney Creek Bridge. Jul. 8, 2016 6:00 p.m.
A derailment on the Stoney Creek Bridge in Glacier National Park last winter was the result of a marshalling error, says a report by the Transportation Safety Board. CP Rail Train 199 derailed on January 13, 2015, at about 5:30 a.m. when six cars jumped the track while it was crossing the bridge. The cars dangled precariously over Stoney Creek while CP Rail crews worked to get them back on the track. No one was hurt and nothing was spilled as a result of the derailment. The Transportation Safety Board wasn’t notified of the incident until a day after it occurred, when the Review called with questions. The TSB released their report on the incident on Thursday, June 30, just before the Canada Day long weekend. You can read the full report at the end of this article. Marshalling refers to the way rail cars are aligned on a train. The Review reported on concerns by local engineers about marshalling errors in 2013. In the case of Train 199, it was marshalled in a way to go through the Macdonald Tunnel through Rogers Pass, however track delays led rail traffic controllers to route it over the bridge and through the Connaught Tunnel. The train had heavier loads in the front and rear of the train. The forces being exerted on the train while it crawled up the hill and over the bridge allowed six cars to “stringline” and pop off the track. To visualize the situation, picture yourself holding a curved piece of string. If you tug on both ends, it snaps into a straight line. That’s what happened to the train. According to the TSB report, the events that led to the derailment began hours earlier when another train was allowed to pass through the Macdonald tunnel ahead of Train 199. The first train was behind schedule and the crew was running over their permissible hours of work. Because of that, Train 199 was delayed by three hours so the tunnel could be vented before it passed through. However, instead of waiting, the rail traffic controller opted to send Train 199 along the alternate route over the Stoney Creek Bridge and through the Connaught Tunnel, even though the train was very close to the tonnage limit for that route. Train 199 consisted of three locomotives, 43 cars, weighed about 4,775 tonnes and was 6,812 feet long. It had left Field, B.C., just after midnight and was headed to Revelstoke. It refuelled in Golden heading through the mountains. While Train 199 sat in wait, the train crew and RTC discussed going through the Connaught Tunnel even though they were close to the tonnage limit. The RTC director approved the switch and the train began the ascent to the Stoney Creek Bridge. Because of the heavy weight of the train, the crew said it would need to run non-stop across the bridge in order to maintain momentum. 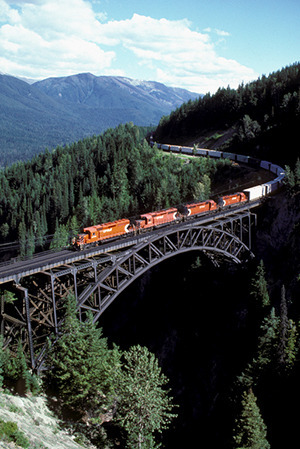 As it climbed through Rogers Pass, it eventually slowed to a crawl, stopping on a curve, with the head of the train at the west end of the bridge. The crew made an attempt to get moving again without success. They then tried to back up onto another track where the grade wasn’t steep. That movement activated an emergency brake. At that point, the conductor got out of the train and realized it had derailed over the bridge. The Transportation Safety Board determined that the marshalling of the train was at fault since it wasn’t set up to go through the Connaught Tunnel. It found that the maximum tonnage was exceed on four of the trailing cars on the train. “The train crew did not, however, completely recheck” the marshalling restrictions for the track, the TSB report says, adding the no formal policy existed at CP Rail to check for marshalling issues when a train is rerouted. In addition to the marshalling, the TSB found that fatigue may have been a factor. They determined that the RTC director had been up for 13 hours when he was called in to work early on the evening prior to the derailment, and was awake for 22 hours straight when the incident happened. “The director was in a fatigued state at the time the decision was made to reroute the train,” the report says, adding that it can’t be determined whether fatigue played a role in the marshalling error. The report says CP Rail made changes to its trackside scanners to detect marshalling violations, and that it changed the role of the RTC director with regards to train marshalling. The report makes no mention of the delay in reporting the incident. James Carmichael, an investigator with the TSB, said they did discuss the delay with CP Rail, but because it didn’t impact the investigation, they didn’t pursue the issue.